The 4-year-old girl at the center of a lengthy, high-profile custody dispute between her Native American father and her adoptive parents has been returned to the couple, a spokeswoman for the adoptive family said Monday. Earlier in the day, the Oklahoma Supreme Court ruled Dusten Brown, the girl's father, must return the girl, named Veronica, to Matt and Melanie Capobianco, who live in South Carolina. "Veronica is safely in the arms of her parents and has been reunited with her family. Our prayers are with everyone involved this evening. There is no happy ending in this travesty, only closure," said Jessica Munday, a spokeswoman for the family. Brown's attorney, Clark Brewster, said his client handed Veronica over Monday night. He said the Browns were "devastated" but thought it best after the court's decision to hand Veronica over to the Capobiancos, with whom she spent the first two years of her life. "One thing we wanted to avoid was some type of showdown, or sometime of event that would affect Veronica," Brewster said. 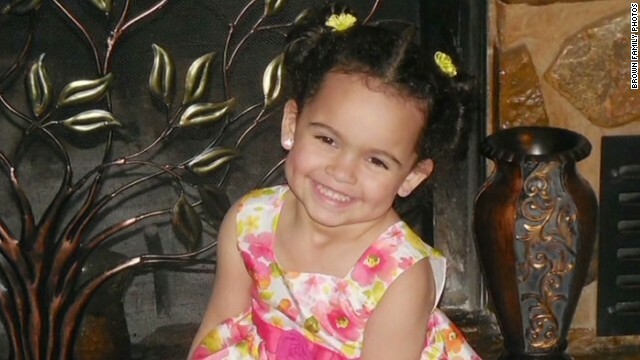 A family court judge ruled in Brown's favor in late 2011, and he took his daughter back. The Capobiancos had fought ever since to have Veronica returned. In June, a divided U.S. Supreme Court sided with the Capobiancos. The justices said the adoption was proper and did not intrude on Brown's federal rights. Monday, it lifted the stay after the two sides couldn't come together on a custody agreement. What takes the cake about those Occupy protestors was all the arguing I had to settle between two neighbors. One neighbor was angry at the other neighbor who supposedly stole his gas grill out of his carport. Turns out that the occupy protestors did it, using all the gas in the propane tank and returning the grill to the wrong yard- BROKEN. That's what finally convinced the riot police to run the bums out of the neighborhood! Wow. That's quite the story. I don't suppose you have a link to that? This sounds like an interesting case. You can try the police reports, but chances are unless someone was arrested or shot you won't find it. By all means, proceed, Governer. Shows how little troll boy knows, the 9th ward no longer has a "ghetto", the Desire Housing Projects were torn down before Katrina regardless of what you think you saw in a rap video. Yes there are still some tensions between neighbors sometimes and every now and then there is a shooting but not 2 or 3 a day like a few years ago. Most of your shootings are uptown now. Don't watch rap, boy. Ghetto don't mean just the projects, fool. You think awfully teeny for the big man you pretend to be. Perhaps I would be a 1%er if a socialist liberal democrat mayor wasn't trying to sell my family's land out from under our feet! Just kidding the millions in royalties the government owes my family for use of land that is leased to them and the mineral rights wouldn't make me a 1%er after it is divided amongst my large family but yes I do have 1%ers in my family that have worked hard from the age of 12 until retirement. Who am I supposed to listen to? Lazy bums who want what they THINK is their fair share or the people that actually earned it? Who am I supposed to listen to? The people that purchased the land, invested into and built multimillion dollar machines to maintain it? Or some fatcat bureaucrat who has invested NOTHING and just wants what he THINKS is his fair share? Plus I have never talked to you IIRC, so obviously I never called you anything at all. You see my dad never had time to throw the football with us when we were little, after work he had to fix broken machines, and spent till well after midnight handleing transactions, land surveys and legalities. Wanna know how we spend time togethor now? In the lawyer's office, fixing broken machines and meeting with other family members discussing future plans. My dad is old 70 to be exact but he still works hard every day to make sure my family keeps what is rightfully ours. My dad is old now and soon he will pass the responsibility to his sons. I will get the job of maintenance, one of my brothers will get the job of legal issues, another brother will get the job of financial and the last brother has the job already of security because he lives in the area. Of course we maintain mineral rights, the lease is up and the government thinks it owns the land. Do you pay rent? If so when your lease is up you have two choices, renew the lease or get out. We have given the government the option of renewing the lease but they think they own the land. What a Shock? It's only the democrats acting this way, Bobby jindal has our back, but the democrat mayor and senator both think they own the land. Two universities, Tulane and LSU Medical lease from us and don't act that way, just the democrats! What is the role of the government if your family is soley responsible for everything? Why was the land leased to the government in the first place? I'm curious. Well Chrissy that is where you are completely wrong, I didn't just inherit the land, I invest my time and money into maintaining machines and land. I get about 2 hours of sleep every night and also work multiple jobs. What have you invested? What gives you the right to get a piece of my pie? Lol @ hamsta, don't flatter yourself. I don't want a piece of your pie. Nor anything else from you for that matter except respect. And whatever made you make that kind of as sumption anyway? I just told you ive worked hard my whole life and have EARNED everything i have so no i want nothing from you nor anyone else! But i will ALWAYS have compas sion for ppl less fortunate than me and that is a bigger treasure to me than your material values! What material values chrissy? I live a simple life, don't even have cable TV or a computer, I just invested into land and machines to hopefully gauruntee me a retirement. You see my point is that 1%ers pay more than their share while the 99%ers pay little or nothing at all and constantly whine about someone else's fair share. Oh puhleeeze! Give me a freaking break! How bout congress members getting kickbacks for their voting practise? You think percentage wise they pay as much in taxes as joe citizen? Only a fool would believe that. Oh can it @ rupert. And gnite @ hamsta. Got my OWN pie to worry about but you enjoy yours. Every time I look at the picture of this little pumpkin, I smile. She is gorgeous. Wow! The theft of Native American children is still going on!